When we visited Thailand, one of my major trip goals was determine, once and for all, which of the three major varieties of coconut curry was my favorite: red, green, or yellow. Each is made from the paste of a different chili, giving the coconut curry its signature color and unique flavor. After extensive sampling (all in the name of research, of course), I determined that it is the red coconut curry that rules my heart. Happily for coconut curry lovers on this side of the Pacific, red coconut curry is also the easiest of the three to make at home, because its most important ingredient, Thai red curry paste, is widely available at most grocery stores, and even Target. Coconut curry is also fast. Start to finish, you can have this Chickpea Coconut Curry on your table 30 minutes from now, even less if you are super speedy, and if you discount the rice, it’s also a one-pot meal. Translation: Fewer dishes. Less time. More coconut curry eating! 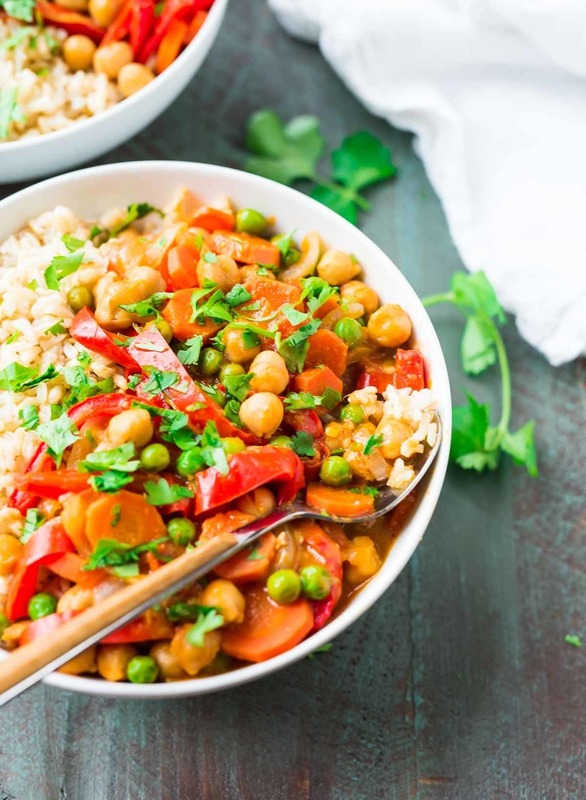 In Thailand, most of the coconut curries we tried were made with chicken, but to keep this recipe extra super duper speedy, I turned it into a Thai vegetable curry by using chickpeas instead. 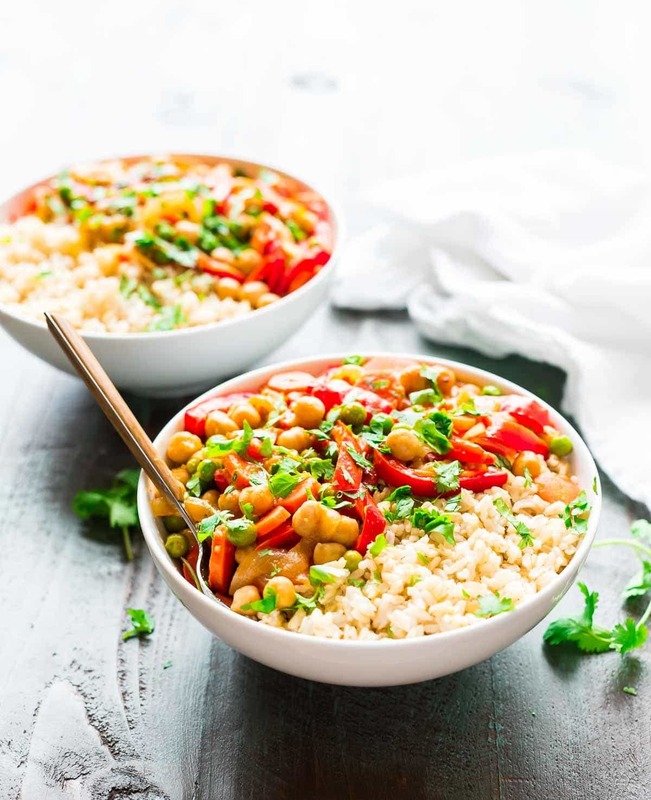 The chickpeas’ mild flavor meshes well with the bolder spices in the easy curry sauce, and their pleasantly chewy texture is a nice contrast to the sauce’s creaminess. 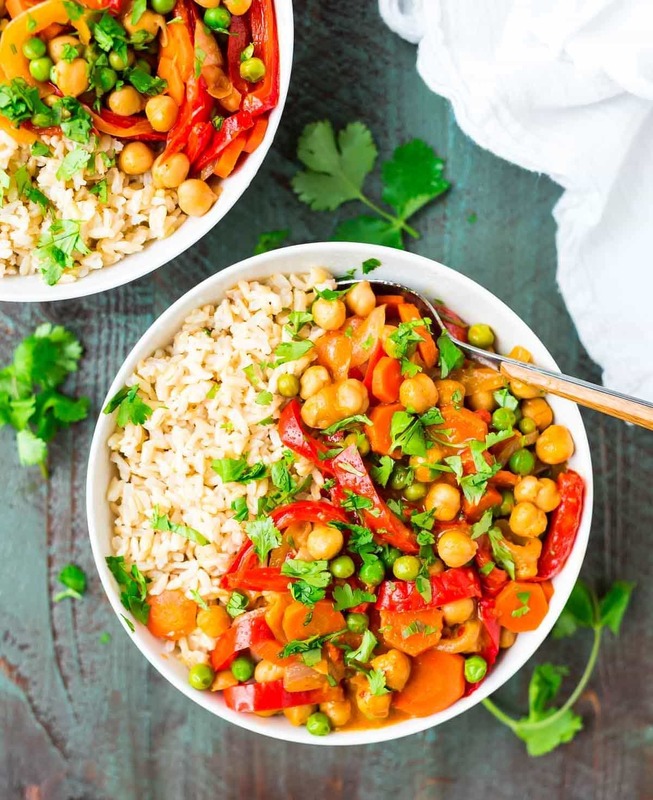 For those with dietary restrictions, this a vegan curry recipe, and whether you decide to add meat or stick with the chickpeas, this coconut curry is also gluten free. Vegetable-wise, I used bell peppers, onions, carrots, and peas, all of which I found in my coconut curry bowls in Thailand at one point or another. Eggplant was also a common addition, and I imagine this Thai coconut curry recipe would be equally delicious with any other vegetables you happen to love or have lurking in your crisper drawer right now. I’ve been missing Thailand more often lately, which I’m guessing is a product of both the return of winter temps over the weekend and the fact that, the more distance I have from my time there, the more and more I realize just how special it truly was. It’s comforting to know that while I might not be able to sneak back to Chiang Mai to bathe an elephant anytime soon, I can relive our adventures via this easy but impactful Thai coconut curry. 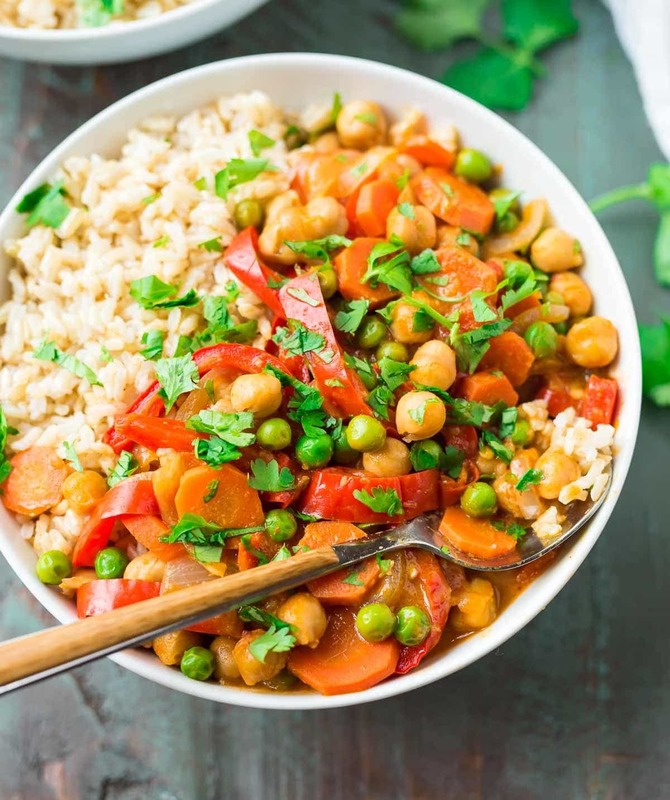 This easy vegan Chickpea Coconut Curry is healthy and FULL of flavor. Ready in less than 30 minutes, not too spicy, and perfect for fast weeknight dinners. Heat a large pot such as a Dutch oven over medium. Once hot, add the coconut oil and onion. Sauté for 2 to 3 minutes, until slightly softened. Add the garlic and ginger and let cook 30 seconds, then add the red curry paste and red pepper flakes. Stir to combine and let cook 1 additional minute. Add the carrots and bell pepper and stir to coat with the spices and curry. Add the coconut milk, 2 teaspoons sugar, and chickpeas. Stir to combine and bring to a simmer over medium-high heat. Then reduce the heat to low and continue cooking (uncovered) for 10 to 15 minutes, until slightly thickened and the vegetables are crisp-tender. Stir in the soy sauce and rice vinegar. Taste and add additional soy sauce (for more saltiness), sugar (for more sweetness), or red pepper flakes (for more heat) as desired. Stir in the peas and let cook 3 additional minutes. Serve warm over rice, garnished with fresh cilantro. Store leftovers in an airtight container in the refrigerator for 3 to 4 days. I do not recommend freezing, as I have not had the best luck freezing coconut milk–based sauce. This looks so delicious and I want to make it — but I’ve resisted buying the red curry paste. >1g sodium per serving of the final dish? I’m presuming most of that comes from the paste (vs soy or the canned chick peas). I can’t justify that in our diet. Have you heard of or have you seen any lower-sodium options that you could recommend? Hi Nancy, unfortunately I’m not aware of any low-sodium curry pastes. There *are* lots of homemade curry paste recipes out there—I don’t have a recipe or any experience making my own, but I think it’d be a fun project! Plus, you’d be able to control the sodium level as much as you’d like. I hope that helps! Thank you Erin and Nikkie – I appreciate your suggestions on how to cut back on the salt! Thanks so much for these additional tips, Nikkie! Yum, I love a good curry! And I absolutely recommend a rice cooker, it just making cooking rice so so easy, and I also use it for other any other grains I’m making – quinoa, trader joe’s grain blends, anything! Thanks for chiming in, Taylor! Hi Sarah! I agree—both Thai and Indian are delicious! Gorgeous! Coconut curries are one of my favorite things to throw together for dinner. I have never tried making a curry with chickpeas though. I hope you’ll give it a try, Milena! Erin, I am really looking forward to trying this when we get home from our upcoming travels, and it will be perfect for when my sister and her vegetarian husband visit. If I recall correctly, the different colors of the Thai curry pastes indicate the heat level, green being hottest, red being the most mild. I think. Green is definitely the hottest. As far as getting a rice cooker or instant pot, I can’t see any reason to get either of them. The rice cooker is of very limited use, and the instant pot duplicates functions you already have in other appliances (except the pressure cooking part). Personally, I find it perfectly easy to cook rice in a sauce pan, which is also useful for other things. I hope you all enjoy the recipe, Susan! And thanks for weighing in on the rice cooker and instant pot question! Would you consider posting a recipe for Thai Green Chicken Curry? I just love that curry over rice at the Thai restaurant. I agree with you that red is best! I like the idea of adding eggplant. At what point should I add it in? Hi Julie, I would probably cube the eggplant and start by sautéing it for 3 to 5 minutes, then add the onions and proceed with the recipe from there. If you give it a try, I’d love to know how it turns out! Hi Erin, I made this tonight for dinner. Followed your recipe exactly and added potatoes and a zucchini . Husband went wild, best ever curry. We lived in Asia for 15 years, so we know a true curry and this is it. Can’t wait for leftovers tomorrow. Thanks. I’m SO happy you and your husband enjoyed the curry, Coleen! Thank you so much for taking the time to leave this wonderful feedback! Made this tonight and it was a HUGE win. Thanks for the awesome recipe!! YAY Erin! Thank you so much for taking the time to comment—I’m so glad the recipe is a winner for you! I made this tonight for dinner and we all really liked it! It came out looking just like your pictures. :) I’ll be making it again in the future. I am so so happy to hear that Dayna, thank you! Thanks for the delicious curry recipe! It’s flavorful and a great way to load up on veggies. When I tried to print the recipe (I know, I’m old-fashioned), the video for how the curry is made ends up being embedded in the page, which is rather inconvenient. Just wanted to let you know. Ana, I am so glad you loved the recipe and thank you for telling me about the video issue. I definitely want to correct that! Just started making Curry. Love this receipe , easy, delicious and beautiful flavour. Nada, this makes me so happy to hear! Thanks for letting me know and taking time to leave this review!! It means a lot. This is a great recipe that is very forgiving and versatile. We have added cooked chicken and other vegetables to it, and it still tastes great. We have also made it with regular coconut milk, and it still works. Even my 1 and 3 year olds liked it! Thanks Erin! Hooray! I’m so glad everyone enjoyed this, Elizabeth. Thanks so much for taking the time to review!